I have been having so much trouble with my skin for the past year or so. I have spoken about it before in depth and briefly but i just don’t know what’s going on anymore, i am so tempted to see a dermatologist because it bothers me that badly. There’s not much I haven’t tried and so i thought i would try out a DIY face scrub for a few weeks to see if i noticed and improvement in my skin. My skin looks so dull and i keep having strange little acne breakouts for literally no reason whatsoever. The reason i am trying a DIY face scrub is because i do believe in home remedies, things like ginger for settling your stomach, lemon to wake you up, chamomile to stop sickness…i really do believe they work (unless i feel like i am dying then i will take all of the pills i can get!!). I don’t think i have ever, ever tried at home skincare. It seemed like too much hassle and i was just so scared my skin would react badly but i wanted to give it a go and here are my findings…. How Much Do I Need Of Each? I know i know, i was so scared of not only using sugar on my skin but… olive oil! I have memories of getting lemony sugar from pancakes all over my face and it didn’t feel good then so trust me when i was so apprehensive about it. The olive oil was a whole other story, i do have combination skin but recently it has been on the oily side so i was preparing myself for an outburst of spots and other things…. First of all i wanted something super easy…I hate going on to sites and finding out you need 12 ingredients that you can only source once a year in…Poland. It just annoys me so, i wanted to make a face scrub that everyone can make and everyone probably has these three things in their cupboard! The brown sugar in my recipe is for exfoliation and moisture. White sugar is better for this but i prefer brown as i just think it’s better for your insides so it must be better on your skin! It isn’t harsh like salt and so it doesn’t hurt to really scrub and get in to your skin. It’s just natures exfoliator! I’m using a fresh lemon to help brighten up my skin. It also helps make the mixture smell a lot nicer. Lemon juice has been used for years in skincare and i just wanted something to stop the dullness and make my face look more…alert. This was the ingredient i was most scared of and if you are just not a fan, you can use coconut oil. Olive oil is actually a wonderful natural moisturizer (wash it off of course!) It also helps people with super dry skin, so feel free to use this scrub on your body if you do suffer from dry skin conditions as who knows, it may help. 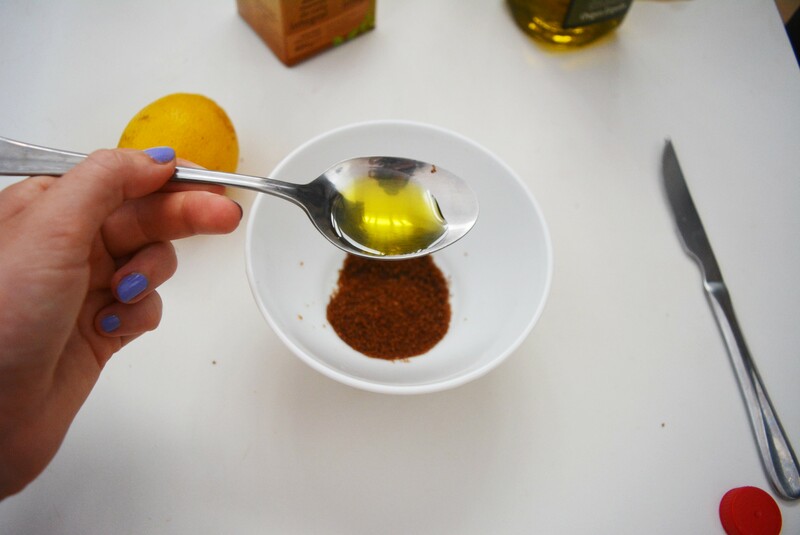 I mixed my brown sugar, olive oil and lemon juice together in a small bowl. I made sure my face was clean and began applying my scrub. It was a bit ‘sloppy’ so feel free to add more sugar if you do want more of a thicker scrub, i was happy with my consistency though and just applied it over the sink. I made sure my hair couldn’t get in the way (sugary hair is never a great look) and began applying. I did smell the olive oil overwhelmingly and it did make me heave a little on a morning but being so desperate, i continued to apply. Once my whole face was covered in this strange homemade scrub, i let it sit for a few minutes. It worked. It honestly worked. It made skin look brighter, tighter and healthier (almost immediately), the sugar gave my skin such a nice soft feeling and really exfoliated away all of the dead skin. The olive oil hydrated my skin and all of my three ingredients combined just made my skin look amazing. Honestly, i was so shocked that it actually worked and that i didn’t start breaking out that i ran in to my boyfriends office on the first day who asked if i had makeup on because my skin looked so good, either he was listening when i muttered why the camera was coming in to the bathroom with me or he genuinely thought my skin looked good (this is coming from someone who is able to tell me i look fine when his back is turned, it’s a wonderful skill!). Joking aside, he really did mean it and asked if he could use some! If you have the ingredients at home i really urge you to try it out, i cannot emphasize enough how nice it makes your skin feel. Don’t be scared of the ingredients because it really does work together and leaves your skin amazing. I also feel like this a little personal triumph for me to have a little more faith in natural skincare, it works amazingly well and i am so trying out more recipes next week. Thank you so much for reading, if you have any questions please let me know in the comments below!